May | 2013 | Mommy. Foodie. Athlete. There’s nothing like a camping trip! This trip is to the Taylor Family Campground on the Delaware Water Gap. We are heading out on a two night trip, which will involve hiking the Appalachian Trail and checking out the Lakota Wolf Reserve. This will be my first time camping on my modified Paleo Diet, and it has made planning ahead even harder than the typical camping trip. How am I going to do this without s’mores?? As I type this, my fridge is full of yummy goodies for the weekend. I will prepare this meal before we hit the road so that it is ready to throw on the fire as soon as we get set up. 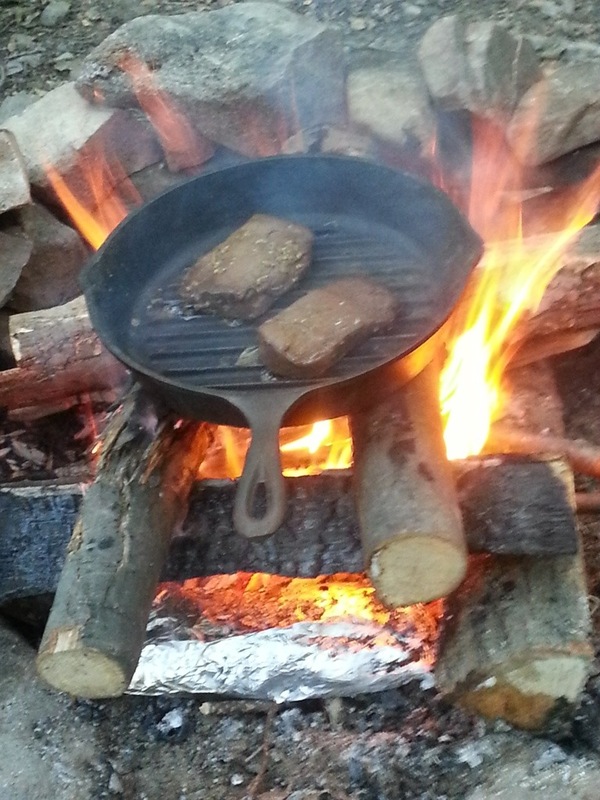 When we return, I will update this entry with pictures of my campfire creation….for now, fingers crossed that everything will turn out delicious. 1. To create the marinade, whisk together garlic, Worcester sauce, and brown sugar in a small bowl. 2. Place the buffalo medallions in a ziplock bag and pour the marinade over them. Remove all air from the bag before sealing and then pack in the cooler. 3. Peel the beets and cut into 1 inch chunks. Remember, they will stain your hands and countertops. You may choose to use gloves, and make sure to clean up with bleach. 4. In a medium bowl, stir the beets with the olive oil, salt, and pepper to coat them. 5. Using heavy duty aluminum foil, wrap the beets in a packet that will be thrown right into the fire to cook. Place the packet in the cooler for the trip to the campsite. 1. Get the fire roaring! Hint: use way more kindling than you anticipate needing. 2. Once the flames have died down you will have nice embers. Place the beet foil packet right into the Embers. They will need 40 minutes to cook. 3. With about 15 minutes left for the beets to cook, place the cast iron skillet on the embers to heat up for 5 minutes. 4. Cook the steaks to your preferred doneness on the skillet. 3-4 minutes per side will give you a juicy medium rare! 5. Using the potholder, remove the beet packet from the fire and carefully unwrap. 6. 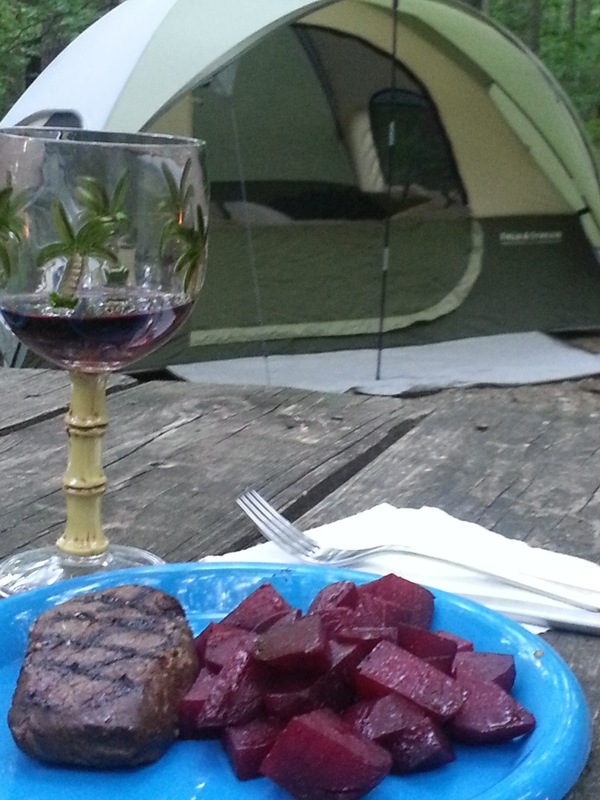 Serve a mound of beets with a juicy buffalo steak, and make sure to pour yourself a glass (or plastic cup….we are camping after all) of red wine. As the weather gets warmer, I am more inclined to get out of the kitchen when cooking. Salmon is one of my fiance’s favorite foods, so I when it is on sale at our local supermarket, I jump on it! If you don’t have a grill, this could also be done on the stovetop. Cook times are about the same, just make sure that you use a non-stick skillet with a mist of olive oil. 1. In a small bowl, create the marinade by wisking together teriyaki, garlic, seasame seeds, red pepper flakes, and ginger. Pour the marinade in a ziplock bag with the salmon and refrigerate for at least an hour. 2. Preheat the grill to medium high heat. Spray cooking spray on the grates so that the salmon does not stick. Remove salmon from the marinade (SAVE THE MARINADE) and grill for 4 minutes on each side. 3. While the salmon is cooking, in a wok over high heat, stir together the remaining marinade with the broccoli and water chestnuts. Cook until broccoli is tender. 4. 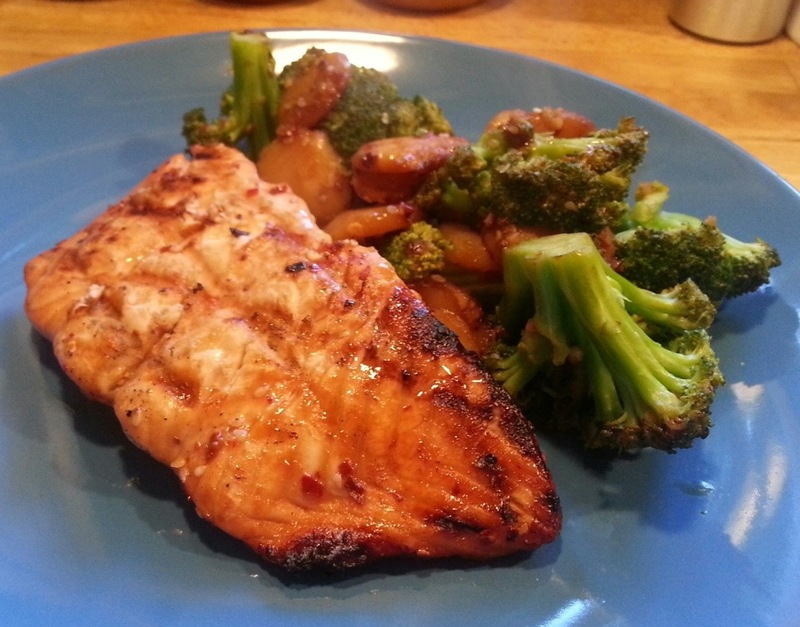 Plate the stir fry veggies with the grilled salmon on top and enjoy! Our wedding is coming up, and my bridal shower was two weeks ago. For someone who loves cooking and kitchen gadgets, registering was like setting a kid free in a candy store! We registered at two places: Bed, Bath, and Beyond – so that family and friends could take advantage of their 20% coupons, and William Sonoma – for those luxury items that we would never dream of buying for ourselves. Our friends and family were so very very generous with their gifts, that it was overwhelming! -Luckily, my organized bridal party wrote what each guest gave on the card. When we got home, I had my fiance read the card and then find the gift in our piles. This way he was able to learn names and stories about my many family members as well as see what they gave us. -While he was searching for the gift, unpackaging it, and finding a new spot for it in our home, I wrote the thank you. -He would then read the note, stamp it, and lick it. We were able to send out all the thank you notes within two days of the shower, which was awesome because our guests were able to learn how very thankful we were… and we got that out of the way! Ok, so enough about the wedding shower… but I swear, I had a point! After starting the modified Paleo diet, I kept craving my beloved carbs and was attempting to find ways to make veggies mimic them. After a run in between my knuckle and a rusty cheese grater, it was time to register for a mandoline! This is my first attempt at zucchini pasta, and I would not recommend trying this without the right tool! 1. Rinse the shrimp and pat dry. 2. Heat the olive oil over medium high heat. Add garlic and sautee unitl fragrant. 3. Add lemon juice and wine. Lower the heat so that the sauce is at a slow simmer. Cook down until it reduces by half. Add salt and pepper to taste. 4. Add shrimp. Cook for about 3 minutes on each side (just as they begin to turn pink, flip them). 5. Add the zucchini pasta (the zoodles) and cook for approximately 2 more minutes until they are tender. 6. 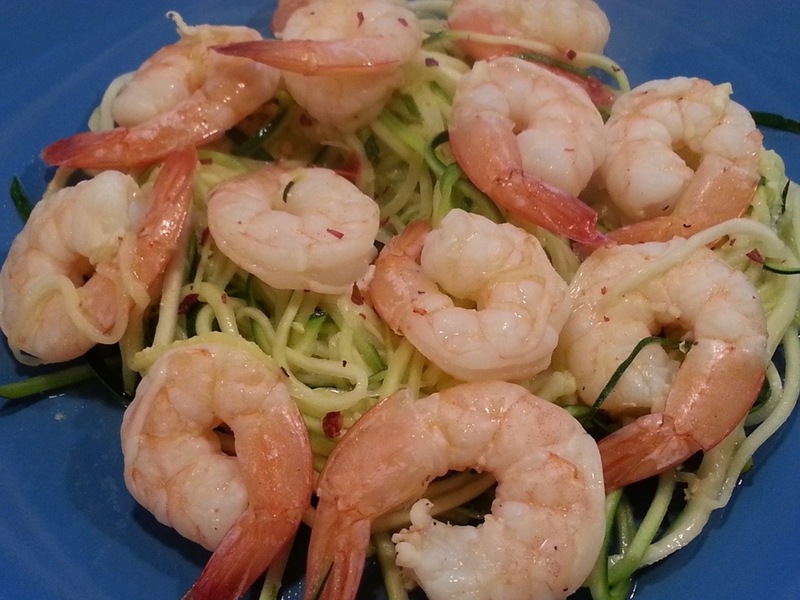 Serve right away with red pepper flakes if you like it spicy! Our local supermarket carries bags of mini tri-colored peppers. They are delicious raw, but I never attempted to cook with them until last night. I sure am glad I did, because it turned out to be a scrumptious meal! My fiancé just called them a “rainbow of yumminess”… Just another reason for me to love him! I made these spicy, but you can modify it for the spice sensitive people by using sweet turkey sausage and cutting out the hot chili powder. 2. Remove sausage from its casing and brown the crumbles in a large skillet over high heat. 3. Lower the heat and add the hot chili powder, onions, and tomato. Sauté for about 5 minutes or until the onion is tender. 4. 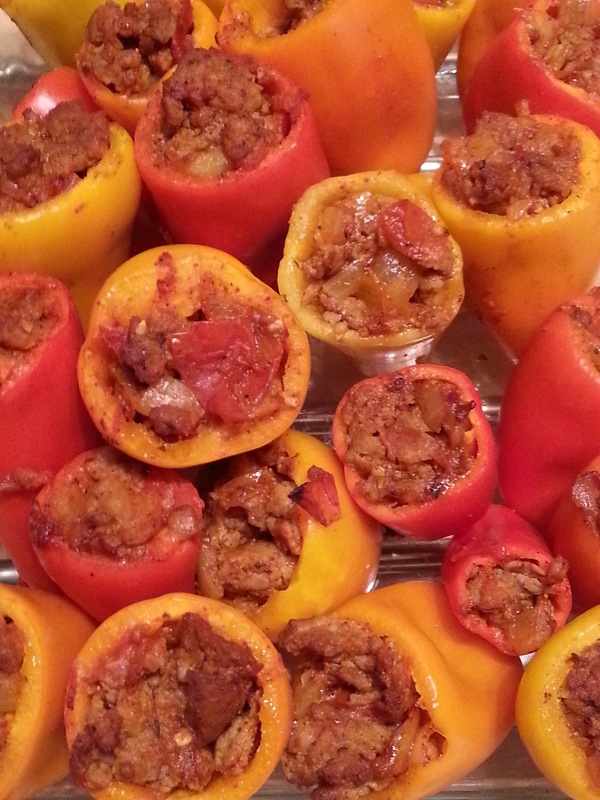 While the stuffing mixture cooks, wash the peppers, cut off their tops, and remove the seeds. 5. Stuff the peppers with the stuffing mixture and place them upright in a baking dish. 6. Bake for 30 minutes or until peppers begin to look wrinkly. Growing up as a Jersey diner employee, the word “beets” brings to mind a fluorescent pink mushy vegetable swimming in onions and vinegar. I would have never anticipated that I would actually grow very fond of beets. A “beet lover” or “beet freak” if you will. The first time I tried them was when traveling in South Africa when I was served grilled beets at a brai. Much to my surprise, they were yummy! I have been enjoying them ever since…and I can’t help but giggle when they “pass” (try this recipe and you will see for yourself)! We have rows of beets planted in our garden, and I am getting very excited to try them! I watch the backyard bunnies, and mentally threaten them just incase they think they are going to break through the chicken coup fencing and nibble my precious beets! 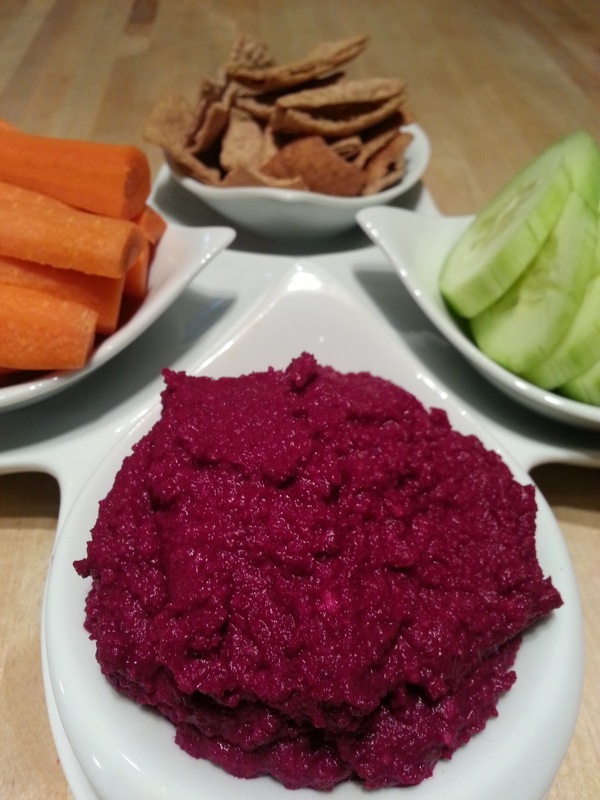 My colleague shared this recipe with me when I shared my love of beets with him. His wife created the recipe, and it sure is yummy! Plus, who doesn’t love bright pink food?? 2. Wrap beets in foil after drizzling with enough olive oil to just coat them. 3. Roast beets for 1 hour or until soft. 4. Allow beets to cool and then peel them (they WILL stain your fingers, countertop, and clothing. Wear gloves if possible and be sure to clean up with bleach right away). 5. In a food processor, combine all ingredients and grind until smooth. 6. Serve with assorted dippers. Veggies, pita chips, or tortilla chips work great! Our garden is growing! 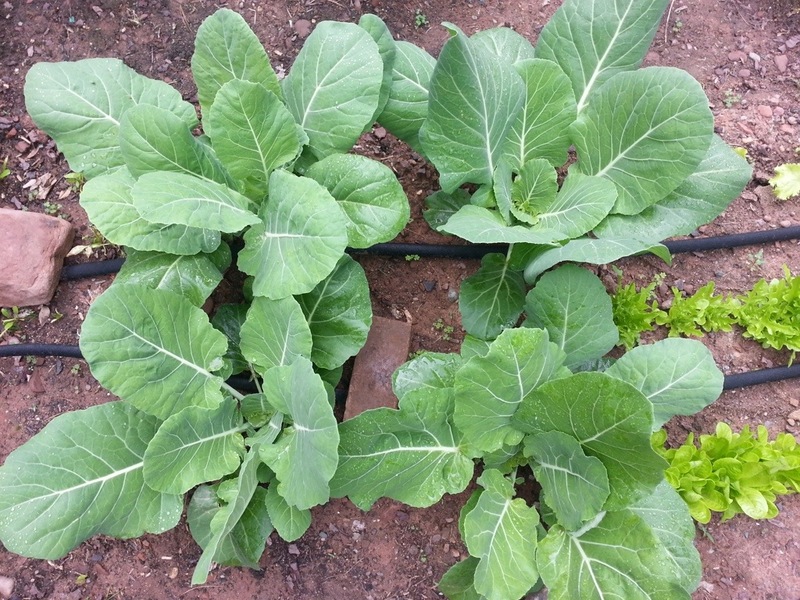 We thinned out the lettuce last week which made for an excellent salad, but now it is time to dig into the collard greens! Eating a no carb and dairy free diet has been hard to adjust to, but with the use of flavorful spices, tasty ingredients, and some creativity, the outcome has been awesome! Piri piri is an African spice that was brought to Portugal and incorporated in many Portuguese dishes. It provides pretty intense heat depending on how much you use, but more importantly, excellent flavor. Combine piri piri with garlic and lemon, and you have a scrumptious meal in the works! 2. While grill is preheating, pour lemon juice over pork, and generously rub piri piri, salt, and pepper on meat. 3. Grill pork for 20 minutes (or until internal temperature is 145 degrees) turning occasionally. When done, remove from grill and cover in foil for 5 minutes before slicing. 4. Right before removing pork from grill, in a large pot, sauté garlic in olive oil until fragrant. Add collard greens and turkey bacon. Cover and cook for 5 minutes (while pork is resting) until greens become wilted. Do not over cook, a little crunch is yummy! 5. 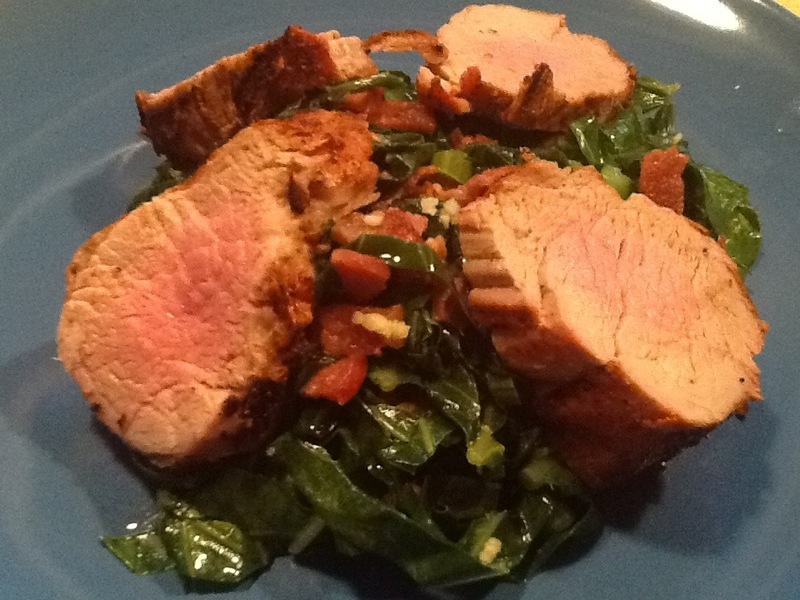 Plate the collard greens with generous slices of juicy pork. Don’t let pork juices go to waste! Pour any drippings over the meat!